The Super Saturday by-elections were a major blow against Malcolm Turnbull. 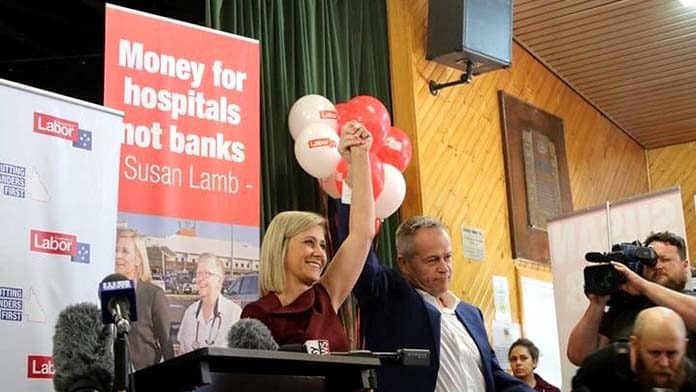 Labor’s stand for “funding for schools and hospitals not billions for big business and the banks” struck a chord. The Liberals are facing annihilation at the next general election. Turnbull’s tax cuts for big business and the big banks made it clear that he is ruling for the rich. The results could hardly have been worse for them. The Liberals failed to win any of the five by-elections, suffering a humiliating swing of 3.6 per cent in the most important contest in Longman. On first preferences, Liberal National candidate Trevor Ruthenberg lost 9.4 per cent of the vote to poll just 29.6 per cent. Labor won comfortably with 54.4 per cent in two party terms. As their panic grows, the Coalition are now contemplating abandoning their tax cuts for big business. The government has committed to one last futile attempt to pass the tax cuts through the Senate this month. But Turnbull now won’t say whether the government will still take them to the next election. One Nation’s decision to favour the Coalition by preferencing Labor and The Greens last, below even the fascist Australia First candidate, did not help them. While One Nation’s vote increased to a disturbing 16 per cent, this is similar to what its candidate polled in a similar seat in last year’s Queensland state election. The Liberals pandered to One Nation’s racism by campaigning against refugees and immigration and scaremongering about “African gangs” in Melbourne. Immigration Minister Peter Dutton announced that he had cut the immigration intake by 21,000 in the last year, claiming he had launched a crackdown and “reintroduced integrity into our migration program”. Then last week he blamed “Sudanese gangs” for the death of a teenager, Laa Chol, at a party in Melbourne. Their racism failed to win votes, but with the Liberals losing votes to One Nation, we can expect more of it all the way to the next election, as the Coalition’s desperation increases. At the last federal election, Longman was one of the country’s most marginal seats, won by Labor with a margin of just 0.8 per cent of the vote. Sitting in outer suburban Brisbane, it typifies the seats that will decide the next election. In Queensland alone, there are seven seats Labor would win if the swing in Longman is repeated—more than enough to kick Turnbull out of office. Both major parties saw it as a testing ground for their campaigns for the general election. Labor also held on in Braddon in Tasmania, with the result practically unchanged from the last federal election, despite a comfortable win for the Liberals in the same seat at the Tasmanian election earlier this year. As expected, it also held the seats of Perth and Fremantle, where the Liberals refused to stand candidates. The Liberals also failed to win back Mayo from Rebekha Sharkie of the Centre Alliance, formerly Nick Xenophon’s party. Mayo was also a blow against the Liberals, as Georgina Downer’s attempt to take her father Alexander Downer’s old seat and become the fourth generation of Downers to sit in parliament, bombed badly. Labor is now even firmer favourite to win the next election, which must be held by 18 May next year. The Liberals’ loss in the by-elections means Turnbull is likely to wait as long as he can before he calls it. But there is no reason for complacency. We can’t just wait for Turnbull to fall over. The union Change the Rules campaign needs to be stepped up to keep up the anti-Liberal momentum. Wage and penalty rates cuts, and Turnbull’s anti-union laws and corporate tax cuts have to be actively fought. The unions campaigned heavily in the seats of Longman and Braddon. But the union campaign can’t be limited to electioneering in marginal seats for an election that could be nine months away. We need more mass stopwork demonstrations like the one that brought 120,000 to the streets of Melbourne in May. The construction union in Sydney has called a day of action for 6 September. Every state should follow the NSW lead. This is the kind of action that can help push Turnbull out. Every union needs to back the rally and mobilise contingents for the biggest possible turnout. An ongoing campaign of national stopwork rallies can build a campaign that can take on the bosses here and now, and pressure Labor to back the changes that unions and workers really need. It was great that Labor took a strong stand against One Nation in Longman, but there needs to be a stronger stand against the racism of One Nation and the Liberals. The Liberals will pander to One Nation and increasingly use racism to scapegoat refugees and migrants. Labor needs to clearly stand against this. A 500-strong demonstration led by South Sudanese youth marched on the offices of Channel 7 in Melbourne, who had just run a disgraceful racist report fearmongering about “African gangs”. The Andrews Labor government in Victoria is introducing new “anti-association” laws, making concessions to this fearmongering when it should simply reject it. When Labor calls for cuts to temporary migration by international students and limits on the temporary visas of foreign workers, it weakens the union movement and legitimises Turnbull’s racism. Similarly, Labor’s support for the detention of asylum seekers on Manus and Nauru means Dutton’s refugee-bashing is unchallenged. Turnbull has been weakened. Now we need to keep fighting to build a stronger movement to beat the bosses and finish him off. For that we need protests, strikes and demonstrations in the weeks ahead.